Crock Pot Ham Steak Dinner - Recipes That Crock! Are you looking for a great one pot meal? 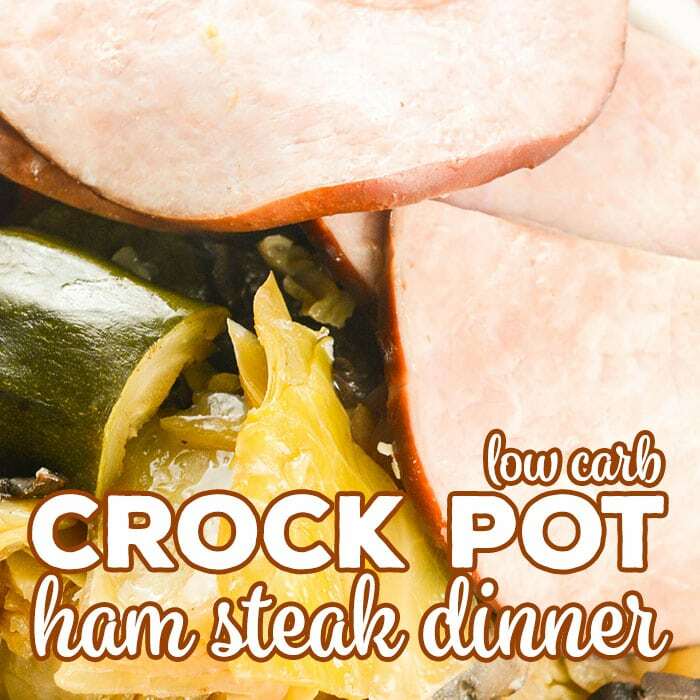 This Crock Pot Ham Steak Dinner is an easy fix it and forget it meal that is an entire dinner in one pot! It is also a great low carb crock pot recipe. The other day James, one of our Crock Partners over on Patreon, mentioned that he thought we could adapt our Campfire Chicken to a ham recipe and I was totally excited to give a try. Not only did I think it would be a great flavor combo, I also LOVE having leftover ham recipes! This recipe did NOT disappoint at all. I love the twist on the flavor and it is definitely going into our regular rotation! 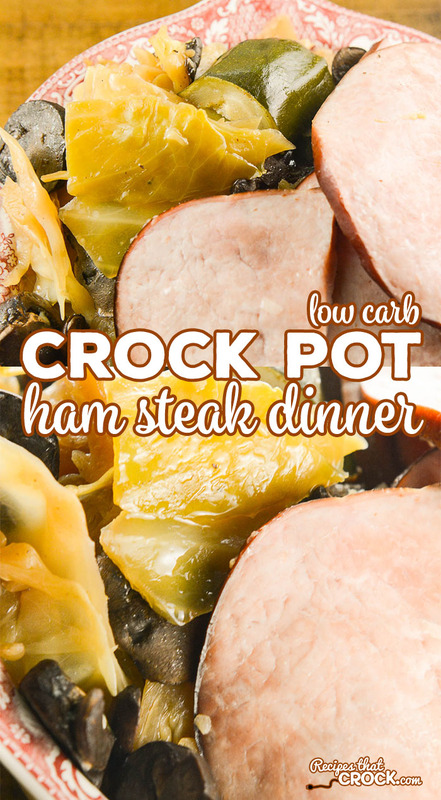 It is super simple to make Crock Pot Ham Steak Dinner. In a 6-8 quart slow cooker you just layer your cabbage, then mushrooms, then zucchini and season with seasoning salt, pepper and garlic. Then you just top with the butter and the ham steaks and cook on low for 6-8 hours or until your veggies are tender. Heads of cabbage vary greatly in size. We generally try to choose a small head or only use half of a large head so everything will fit in the slow cooker. You can use other forms of ham if you’d like: leftover ham bone, ham hocks, Ham cubes, etc. Cut your cabbage into smaller pieces and your zucchini into larger chunks so that they will cook more evenly. Cabbage usually takes longer to cook and zucchini typically cooks faster. Looking for more low carb recipes? 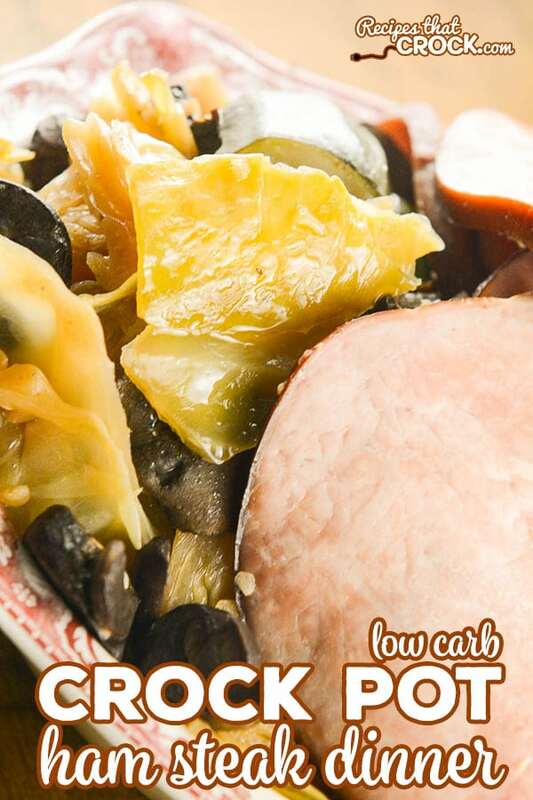 Bookmark our low carb page here. In a 6 -8 quart slow cooker place cabbage, then mushrooms and then zucchini. Season with Lawry's, pepper and garlic and top with butter. Top with steaks, layering if necessary. Cook on low for 6-8 hours or high for 4 hrs or until veggies are tender. You can use other forms of ham if you'd like: leftover ham bone, ham hocks, Ham cubes, etc.